Lanzhou located in northwest China is the capital city of Gansu province. With the Yellow River, one of the important rivers of China running through the city, Lanzhou is abundant in rich crops of many juicy and fragrant fruits. When comes to the word Lanzhou, it may remind you that it is the key point of the ancient Silk Road which covers an area of 1631.6 square kilometers. With Dunhuang Mogao Caves to the north, Labrang Monastery to the south, Bingling Temple Grottoes to the west and Maiji Caves to the east, Lanzhou is a hub of the Silk Road Tourism Ring. A Lanzhou Tibet tour will take you to visit two different cities. A short tour in Lanzhou will bring you the beautiful scenery of Yellow River. And It is also a good place to appreciate the unique culture of Islamic. Then make your way to Lhasa, the capital city of Tibet. During the tour of visiting Lhasa, you will see the famous world heritage the Potala Palace and Jokhang Temple, and you are going to visit the monasteries that full of Buddhist characteristic. And you may have a good opportunity to witness the spectacular view of Mount Everest. Lanzhou is a transportation hub connecting western and central China. There are multiple flights to many large cities from Lanzhou. With three train stations, Lanzhou is the termination of the Longhai Railway, an important east-west rail route in China. Thus it is so convenient to travel to Tibet from Lanzhou. If you wanna travel to Tibet from the mainland China, Lanzhou is definitely a suitable gateway. And you are supposed to take at least 3 days in Lanzhou to explore this beautiful city. After that, make your way to Tibet to explore this holy land. Lanzhou, the capital city of Gansu Province is one of the popular gateways to Tibet, This Lanzhou Tibet tour will take you to visit both Lanzhou and Tibet. During the tour, you may see the splendid view of nature and appreciate the profound Buddhist culture of those two places. How do I travel to Tibet from Lanzhou? You can choose either fly to Lhasa or take a train to Lhasa from Lanzhou. However, please note that there is only one direct flight to Lhasa from Lanzhou operated by two air companies, Shenzhen Airlines, and Tibet Airlines. It’s not daily, meanwhile, it departs at night and arrives in Lhasa at 00:15 a.m. Frankly speaking, it’s not that convenient to take this one. The rest flights to Lhasa from Lanzhou are all connecting flights with a stopover in other cities of mainland China, such as Chengdu, Kunming, Changsha, and so on. It's not advised to take the connecting flights as it's not only a detour but also more costly unless your time schedule is very tight. Is a good idea to take a train from Lanzhou to Lhasa? How is the train condition? 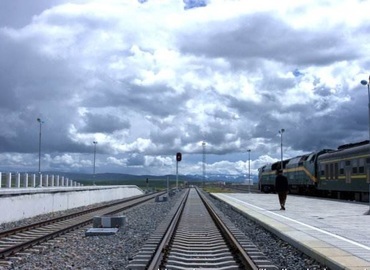 Yes, taking a train to Lhasa from Lanzhou is more recommended compared with taking a flight. The train is in good condition. It takes around 24-25 hours to arrive in Lhasa. You just need to stay for one night on the train. 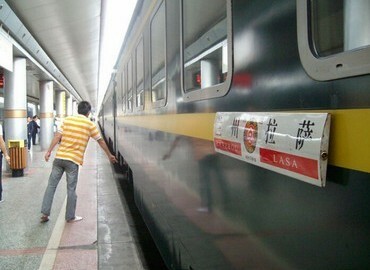 There are four trains to Lhasa from Lanzhou every day. Xining is the first stop during the trip, as well as the starting station of Qinghai-Tibet railway. The train will change to Oxygen offered train which is designed to ride on the highland. Thus, the passengers could adapt to the altitude change step by step and avoid the high-altitude sickness effectively. What documents do I need to visit Tibet from Lanzhou? One important note, no matter you take a flight or a train to Tibet from Lanzhou, the original Tibet Travel Permit is a must paper. Other necessary documents are your valid passport, China Visa, or any other certificate you used to apply for the Tibet Permit, like a Residence Permit, etc.